Book now the best shore excursions in Nice. High quality and safety at the lowest prices. If your are looking for Shore Excursion Nice, book now the best guided tours at lowest price with Ancora Tours. Since 2003 we offer you official guides in english, transportation and travel insurance, all included. The highest quality at the lowest rates. The birthplace of the painter Henri Matisse is an elegant seaside resort in the lush region of Provence. Thanks to its beautiful view on the Promenade des Anglais and its Belle Époque buildings, Nice has become the second most visited city in France after Paris. Let’s have a coffee together during this shore excursion in Nice and enjoy! What’s eating: Local fish Soup, made with chili aioli, croutons, and grated cheese. Or Tourte aux Blettes; pastry filled with Swiss chard. Souvenir: Pastries, jams, chocolates and rose petals. Dress Code: Please note the dress code recommended to enter any church. No shorts, bare shoulders or miniskirts. This applies to both men and women. Comfortable walking shoes are recommended. To start the Nice shore excursion we’ll drive for 25 minutes from the port of Villefranche, or 50 minutes from the port of Cannes. 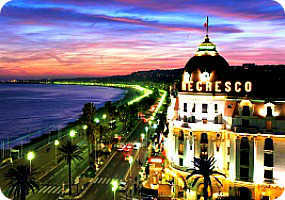 Capital of the French Riviera, Nice is sits on the wonderfully named Bay of Angels, or Baie des Anges in French. The panoramic bus tour will pass along the Promenade des Anglais, named after the English tourists who spent winter in Nice in the 18th century. Here we can admire the beautiful buildings of the Belle Époque, Mont Boron and the Hotel Negresco; now a hideaway for VIPs and celebrities. Our Nice shore excursion will then make an external visit to St Nicholas Orthodox Cathedral. Completed in 1912 after a donation from Tsar Nicolas II, it is the largest Russian Orthodox Cathedral in Western Europe. After, it’s time to spend some time in the old town and admire the Baroque and religious architecture around us. We’ll visit the famous flower market of Cours Saleya. Tourists come here to breathe in the perfumed air and take photos of the rainbow of flowers on display. The flower market closes on Mondays, with stalls of antiques and vintage treasures taking it’s place. At the end of the Nice shore excursion, you’ll have about an hour of free time. Stroll along the Promenade des Anglais or spend some more time exploring the city centre.